When we think of memes, we usually imagine poorly drawn frogs with varied facial expressions, syntactically error-prone shiba dogs, or, for Berkeley students, the UC Berkeley Memes for Edgy Teens Facebook page. For most of us, memes are just some random facebook posts on which we tag our friends for a few laughs. Illustrative of this view, a satirical article from the Northwestern Flipside that claimed the university was offering a major in meme studies was bombarded with aggressive comments that attacked the modern generation for pursuing disciplines that have no real world implications, without understanding its satirical nature. Delving a bit deeper, there are three basic requirements to meme evolution. First, there must be a variation in memes - biologically akin to animals with varying genetic characteristics surviving in the wild. Second, just as the longevity of one animal does not dictate a gene’s reproductive success, memes cannot be reproductively successful confined to a single host; rather meme must be transmitted fundamentally through imitation - replicating from one mind to the next - as well as interaction with other memes. These memes collectively form the meme pool, which is the memetic equivalent of a gene pool, or populating of interbreeding genes. Finally, there must be a differential reproductive success among memes within the meme pool; crucially, successful memes do not necessarily benefit the mind in which it resides, but rather survive in of itself. The easiest example for illustrating this idea is rhymes - a meme that contains rhymes are generally more successful than those that do not, but this does not necessarily aid the survival of the host human and only enhances the longevity of the meme itself. Another example is chain mail that places curses on the well-being of you or your family members, which compels receivers to forward them to other contacts even at the risk of appearing irrational or stupid. The above information derives from the academic discipline known as memetics, or the study of memes. Any further discussion into the field is rather complex, involving discussions of cultural artifacts, computational algorithms for meme evolution, and even neuroimaging. Furthermore, the entire field of memetics is mired in controversy, resulting from those rejecting the core idea of a replicating, transmitting, and mutating unit of culture or those considering memetics as a outright pseudoscience with no evidentiary basis. So while I have briefly explain the mechanism of meme evolution, be aware that the very validity of this field is still debated, and anyone wishing to look further into the subject should look to other, more detailed sources for a more comprehensive understanding of memes. 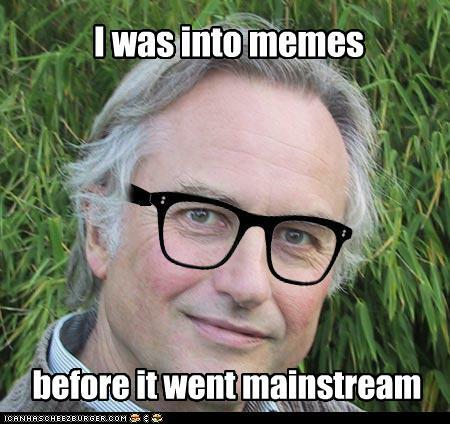 The aforementioned explanation of meme evolution does not do the contentious field justice, but I think it still manages to highlight the fact that memes are not just funny photos found online, but rather complex cultural mechanism that warrants serious academic debate. Particularly, I draw your attention to the concept of memetic reproductive success. Among the most common mistakes that early evolutionary biologist made was assuming that evolution is a path toward some mysterious higher purpose, that there was some theoretically perfect final destination we are heading toward. However, we now understand that natural selection dictates evolution, such that the driving force of evolution is the capacity for survival within the given external conditions. Similarly, the evolution of memes rely only on its capacity to survive in the current cultural context, often disregarding the factual accuracy of the meme content. That is to say, a meme without any factual basis can spread, flourish, and mutate if it has more potential to “go viral,” whereas a fact-based meme may easily suffer extinction if it just doesn’t have the same flashiness.